L and I really felt like have bubble tea after work one weekend. She really wanted to go to Crystal Mall. However, I was scared. It was the weekend. At Crystal Mall. But I sucked it up and drove there. However after walking around the food court a few times, we still couldn’t pick anything, so L suggested this one restaurant on the ground floor. And that’s Sunshine Cafe, a Taiwanese restaurant. I think most of their meals come with either a drink or soup. Since I’m already having noodle with soup, I picked the drink. They’re supposed to have a daily drink, but I suspect it’s actually the same everyday. Today it’s a Wintermelon drink. It was nice a refreshing. I picked the Deep-fried drumstick. It was sliced in an interesting way in that it became a “T” shape! It kind of tasted like salt & pepper chicken but it was fried like KFC. It tasted great! Not too salty, very crispy. I only wish it were bigger. Like most Taiwanese soup noodles it came in a clear soup. 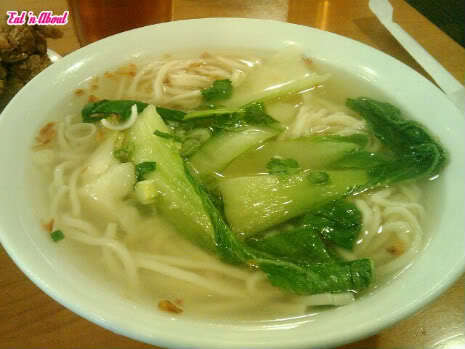 Now usually I hate these types of noodles because the soup is usually very very bland. However that was not the case here. Although I don’t know what’s in the soup it had enough flavor (it was probably only salt or MSG) to taste good. But next time I think I’ll pick the green bean noodle instead of the regular type of white noodles. But enough about mine. L ordered the Seafood Kimchi hotpot. I had a taste and it was more sour soup than kimchi. She had green bean noodles in it and it soaked up all the flavor so it was really good. 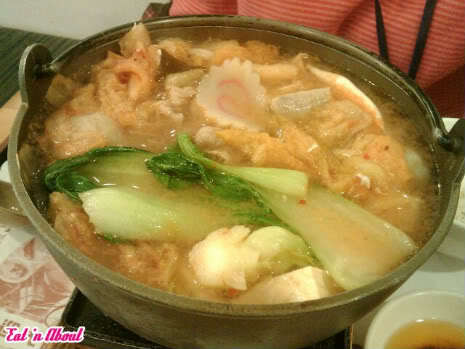 It had the usual ingredients such as fish cake and squid. No shrimp though! I did like this place. I will come back, hopefully on a weekday! You are brave Wendy… Crystal Mall on a weekend… I’ve seen this place many times, maybe when I find a time that I am willing to make it to CM, I’ll try it out! Hi, my first post but I’ve been lurking (dunh, dunh, dunh …..). Xtal Mall is minutes from my office and I go there about once a week (since they opened). In fact I was there today (ate at Wang’s Shanghai Cuisine). 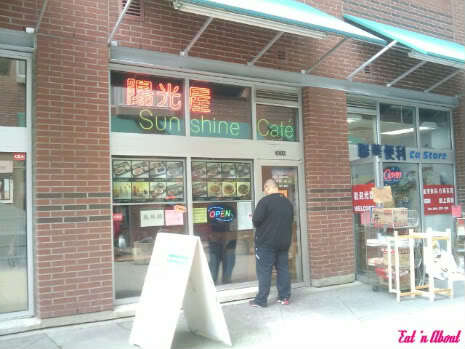 All these years I never wandered into Sunshine Cafe. Thanks for the review. Somehow when I read the title I thought you meant Sunflower Cafe, another Taiwanese eats/bubble tea joint close by, on Royal Oak at Rumble. Good foods generally. And right across the street from them, on the east side, is Sasaya Bistro (sign says Korean hotpot but owner & employees are all Taiwanese). 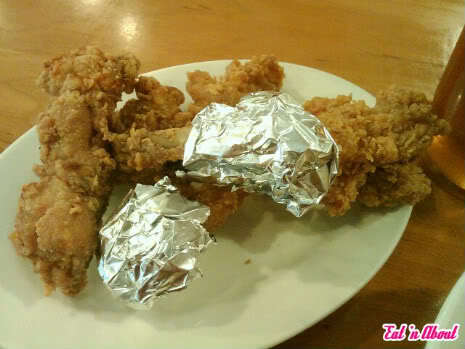 Really good “yan su ja ji” (salty crispy fried chicken) that come as nuggets, drumstick or bone-in pieces. Thanks for the review. 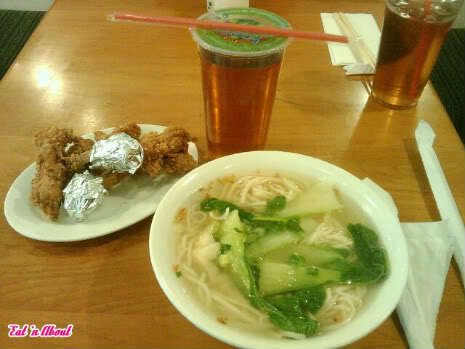 I love Taiwanese food and would love to try next time.